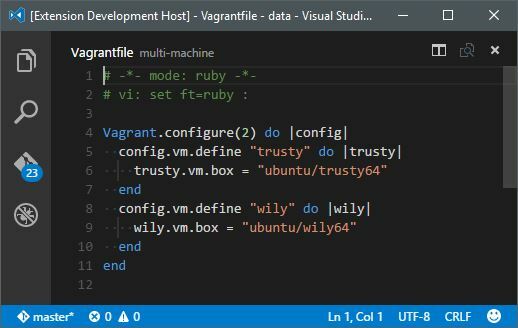 Visual Studio Code>Programming Languages>VagrantNew to Visual Studio Code? Get it now. The extension automatically finds the Vagrantfile files within the workspace and will ask you on which machine to execute the desired command if they are multiple. Tip You can use the Vagrant: Show Log command to show the console output. No extra step is required. Simply make sure Vagrant is still correctly installed and available in your PATH environment variable. Hit Ctrl+P and enter the ext install vagrant command. Warning: be sure to select the extension authored from bbenoist.